The first trial began this week for six of the more than 200 protesters arrested in connection with riots that paralyzed parts of the District during Donald Trump's presidential inauguration. WASHINGTON — Jurors saw video and heard testimony from witnesses caught up in riots that paralyzed parts of the District during Donald Trump’s inauguration as the first trial for some of the protesters continued Tuesday. The trial, before Judge Lynn Leibovitz, began this week and is expected to last a month. More than 200 protesters were arrested on Jan. 20 and six of those are on trial in D.C. Superior Court: Jennifer Armento, Oliver Harris, Brittne Lawson, Michelle Macchio, Christina Simmons and Alexei Wood. They face felony charges of rioting, conspiracy and destruction of property. Approximately 20 people charged in connection with the riots have pleaded guilty, and prosecutors have dropped the charges in almost two dozen cases. So far, jurors have seen surveillance video, and images taken on protesters’ phones and police body cameras. Prosecutors said that windows of several businesses were shattered sending customers and employees ducking for cover. A police officer’s wrist was broken when protesters threw bricks and hammers at him. Tuesday, limousine driver Luis Villarroyal described watching protesters break the windows of the vehicle he had parked, after dropping off five passengers. Jurors saw video of a protester throwing a lit flare into the back seat of Villarroyal’s limousine. He described snuffing out the flare. 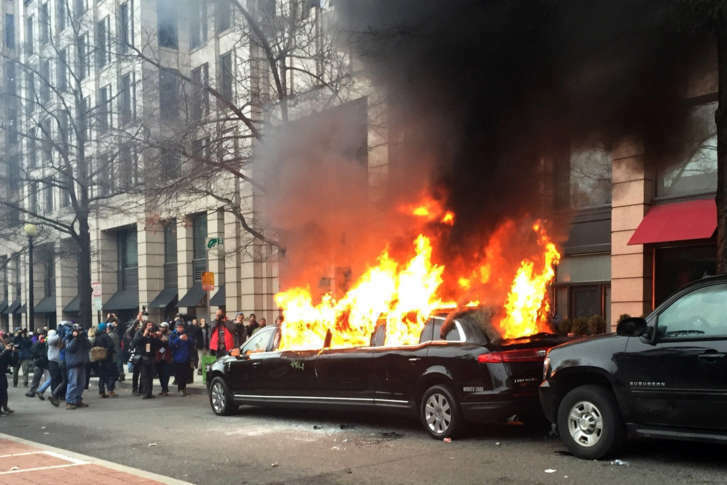 Prosecutors acknowledged that no evidence suggests that the six defendants caused the damage, but their alignment with the so-called “black bloc tactics,” such as dressing in black and wearing masks to avoid being identified, makes them guilty. An employee at a BP gas station at 13th and N streets NW described a protester pounding on the glass booth she was sitting in, while another man cracked the window with a projectile. She said she tried to pile cases of bottled water in front of the door. “I’m scared, because I don’t know if they’re coming in,” she said. The six defendants are represented separately. Defense lawyers told jurors that police rounded up innocent protesters with those responsible for the vandalism, and prosecutors won’t be able to prove their clients committed the damage. Trials for the other remaining defendants are expected to stretch into next year.